Rounding out our journey through all the different exotic items available in this first year of Destiny. We’ve talked about the weapons, and the armor choices for Titans and Warlocks. Today, we’re hitting the last player class – Hunters – and going over their exotic armor. 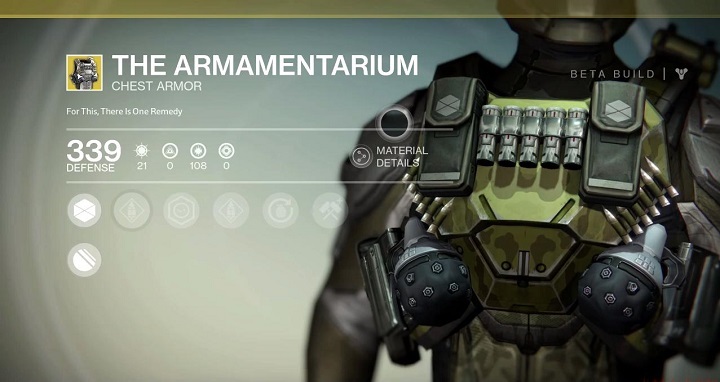 Much like the Titan, Hunters have options for every armor slot, at least ever since The Dark Below. Like we have been all week, we’ll start with the helmets. 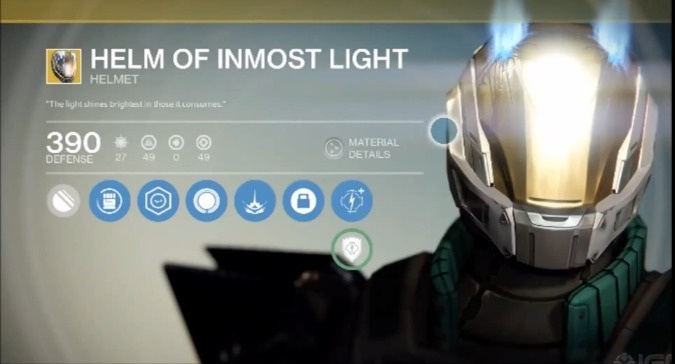 Hunters have access to five helmets – although as we’ll see, they’re really only looking at three of them. In terms of class parity, Hunter choices are definitely skewed more towards Gunslingers. But one of the few Bladedancer exotics does exist as a helmet. But we’ll start with one of the worst exotics in the game – the ATS/8 Arachnid. It’s a Gunslinger pick – but only gives you a zoom for Golden Gun. In theory, that’s great – long-range Golden Gun shots could be super powerful in PvP, and helps keep you safe in PvE. Unfortunately for the helmet, Golden Gun is already incredibly accurate – with really no range issues at all. 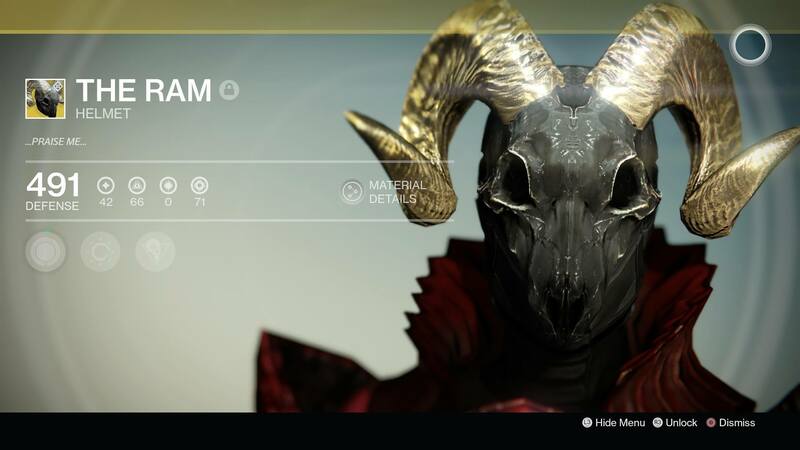 So it’s a total wasted perk – not to mention it’s a pretty damn ugly helmet. The other really low tier exotic helmet is the Knucklehead Radar. It’s a subclass neutral piece, which helps a bit, but the problem again is the exotic perk. It gives you Third Eye – keeping your radar active while ADS with any weapon – which honestly isn’t the worst perk out there. The problem is that it’s a perk that I think best benefits newer players, and as you get more used to the game, loses it effectiveness quickly. I also think it’s a much much more effective PvP perk. It’s not as bad looking as the Arachnid, but still definitely not a great looking helmet. We now can get into the actual contenders for usage here. First up, the best PvP Gunslinger helmet, the Achlyophage Symbiote. Sure it’s a pretty nasty looking beast, but it’s exotic perk is amazing. It gives you an extra shot for Golden Gun – that’s four insta-kill shots for PvP, and can sometimes be the damage you need to for a major or ultra in PvE. 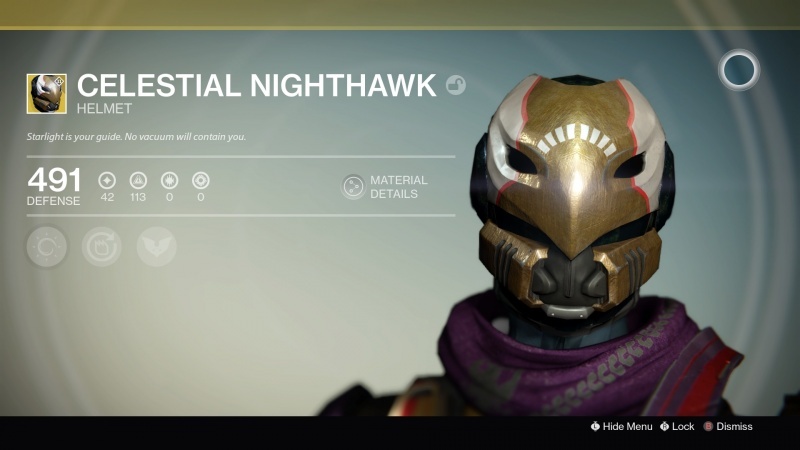 However, since House of Wolves launched, we got a better PvE choice for the Gunslingers – the Celestial Nighthawk. It’s a sleek looker – I love that gold faceplate peeking out from under a nice hood. But the real money here is the exotic perk – it takes all your Golden Gun shots, and puts them into one singular shot. It does 6x damage, and over penetrates targets – this means that Golden Gun can actually take down majors and ultras. Obviously it’s not a PvP helmet, but in PvE, it’s a monster. 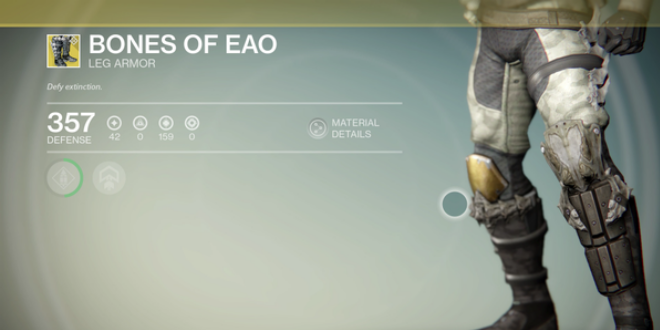 Finally, we get to the only Bladedancer specific helmet – Mask of the Third Man. This Sam Fisher looker makes your Bladedancer abilities use less super energy. That means you get more attacks out of it, which is great in either PvP or PvE. I think it’s a little bit stronger as a PvP choice, but if you’re looking for a Bladedancer specific armor, you’re already limited. Moving on to the gauntlets, we’re only looking at three pieces here. 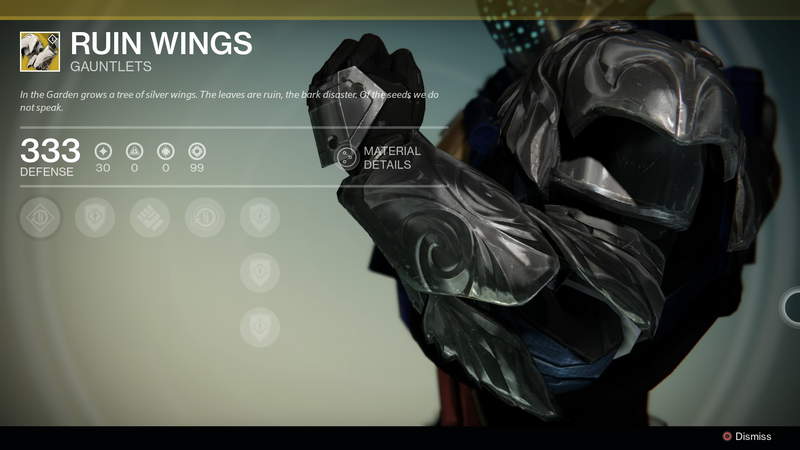 We’ll start with another of the rare Bladedancer pieces, the Don’t Touch Me gauntlets. This is one of a couple exotics that I haven’t actually used, so I could be a little off with the usefulness on the class here. They’re one of the least unique looking exotics out there – but they do have a nice perk going on here. When you take melee damage, you turn invisible – a nice little PvE perk, not so much in PvP. 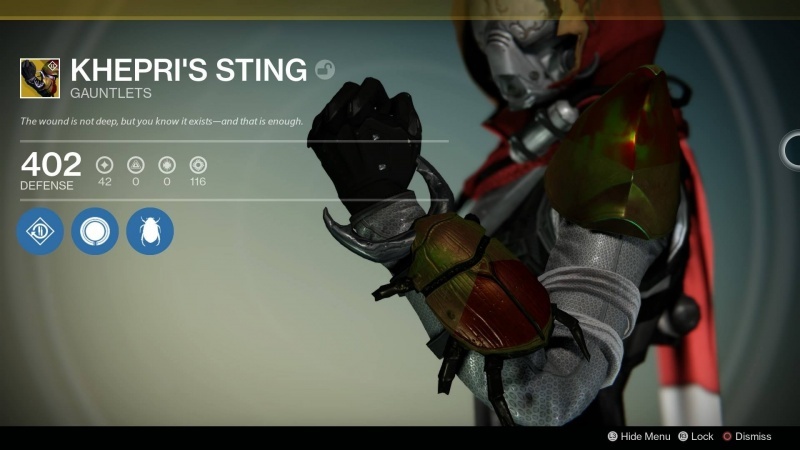 Again, with House of Wolves, we got another great invisibility focused set of gauntlets – the Khepri’s Sting. This is actually a subclass neutral choice – the invisibility granted isn’t tied to a talent grid. This means Gunslingers can take advantage of it. These arms have a ton of talents associated with them. The Invisibility is the start, bonus melee damage when backstabbing – and a hidden effect that adds Damage over Time for melee attacks. That’s a lot of value for a pretty solid armor piece. Add in a fantastic design and you have a winner. 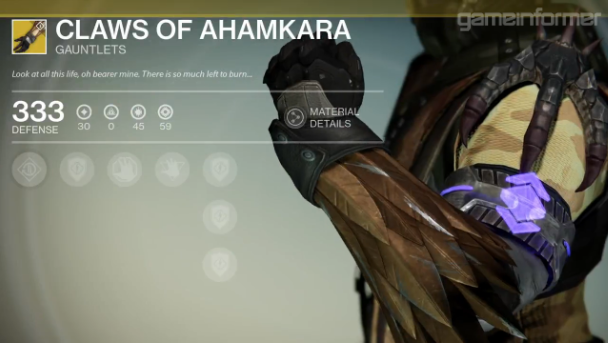 The last piece of arm armor is the Young Ahamkara’s Spine – again a really awesome looking piece of armor based on the Ahamkara. Unfortunately, it’s a terrible exotic perk – your Tripmine grenades last longer. Tripmines are good – doing a ton of damage – but they tend to be really situational, even in PvP. I wouldn’t use my exotic slot on these. When we’re looking at chest armor, Hunters kind of get the short end of the stick here. There’s only two options here, and really both are pretty limited in their usage. First up is the Crest of Alpha Lupi – again. 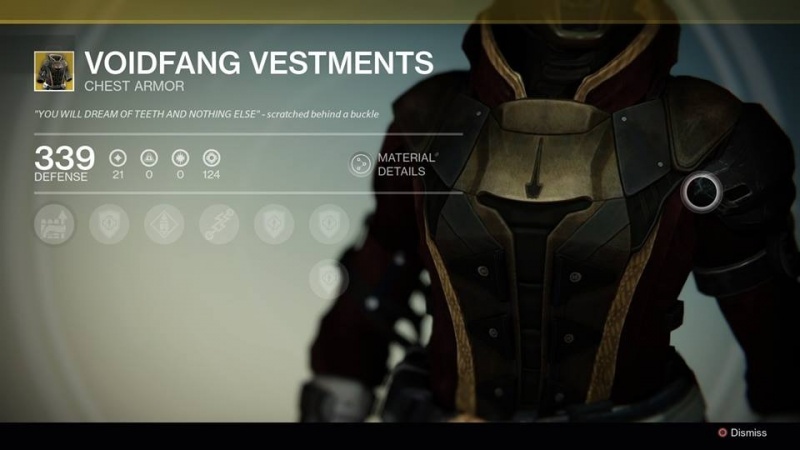 It’s got the same name as the Titan chest piece – and it has the same use. It helps you revive your teammates faster, and you make more orbs. Nice to have for Nightfalls and 3v3 PvP, but not really necessary. It does look real nice – I like the wolf head that’s on this in a more prevalent spot than on the Titan’s. 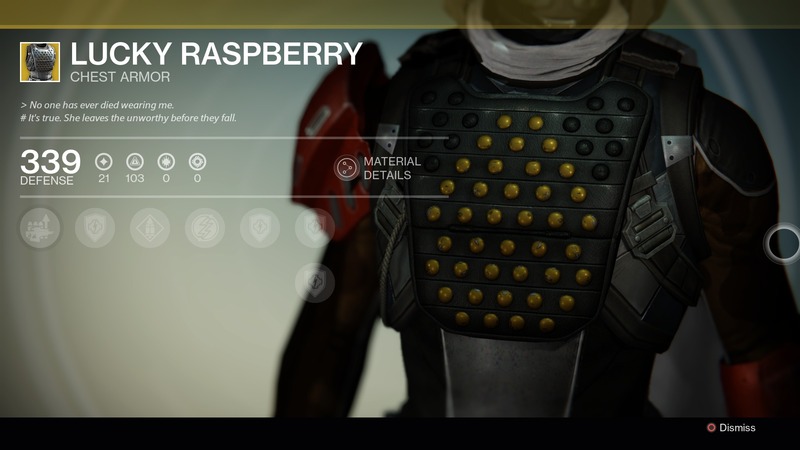 The other choice here is the other major Bladedancer pick – Lucky Raspberry. I think this one is a lot more useful than Mask of the Third Man – it affects your Arcbolt grenade, making it chain longer. To me, those are more useful than Arc Blade – especially in PvE. Arc Blade is great in PvP, but only great for add clearing and invisible reviving in PvE. Arcbolt grenades are good for add damage, PvP kills and can stun majors and ultras. It might be a little plain in its design, but it’s a really great choice for your Hunter exotic, and does actually pair well with shaders. Finally, we come to the leg armor for Hunters. Much like the other classes, Hunters didn’t have any exotics here in Vanilla Destiny. With Dark Below and House of Wolves they’ve gotten one piece from each DLC. Dark Below brought with it the Radiant Dance Machines – subclass neutral boots. They look really cool – there isn’t a ton of armor with a green color scheme, making them look even more unique. In terms of function though, it’s a little less exciting. They make you move faster. That’s it. Sure they pair well with MIDA Multi-tool for PvP play, but that’s about it. It’s definitely not a must have set-up for the vast majority of players or content. 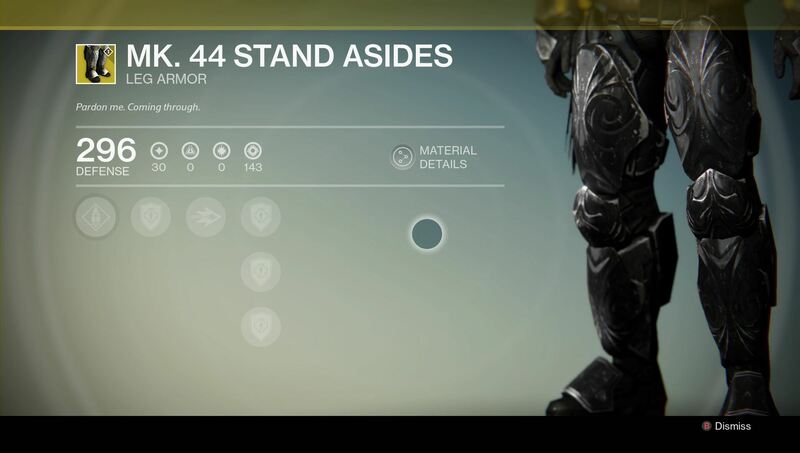 House of Wolves also brought a subclass neutral set of boots – the Bones of Eao. They are subclass neutral, but Gunslingers definitely benefit more from them, since they give you one extra jump. That means you can upgrade your Triple Jump to a Quad Jump. That’s a really cool messing around bonus, but for serious play, I don’t think it’s a must have. It can allow you to make some pretty crazy plays in PvP, but for longevity it’s not the best pick. Use them for a little bit to mess around and because they look cool, but that’s about it. And that will wrap up a full week of looking at the exotic items that have been available to us in Year One in Destiny. We learned this week that some of these will be making the jump to The Taken King here in a couple weeks – we don’t know all of the exotics that are, but I think we probably know most of them, at least weapon-wise. There are still a couple weeks left in Year One to go out there and try to fill out your collections – even if you plan on sharding them, it’s worth grabbing them and holding on to them at least until the 2.0 Update.